Dedicated planning, adventure, thrill and struggle. These are a few things that you plan to face during those years of marriage. You know what gets you through all of them? Love. You love someone and marrying them is the best feeling on the planet. You love someone and asking them to marry you should be the best feeling on the planet. This was probably what, Yasushi ‘Yassan’ Takahashi, a young man from Tokyo, felt and understood in 2008. He wanted to propose his lady love and wanted it to be special and gave it a good thought. His conclusion? Why not use what every human being on earth relies on? Google! 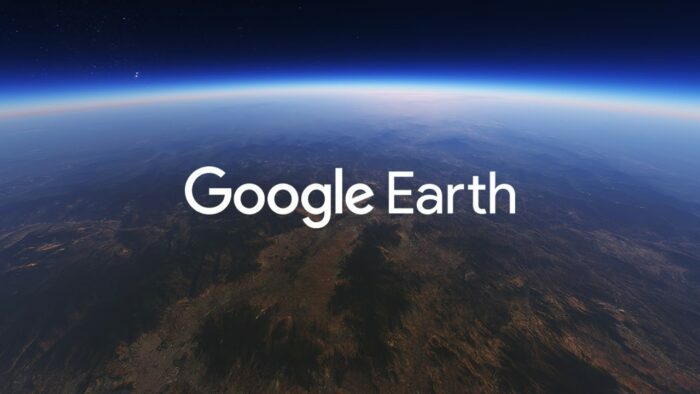 Yassan used Google Earth to go on a journey of a lifetime and finally propose to his girlfriend. He faced the snow, the earthquakes and the rains to get a fascinating result. Yassan used Google to chalk out a route map for his journey of around 7000kms. 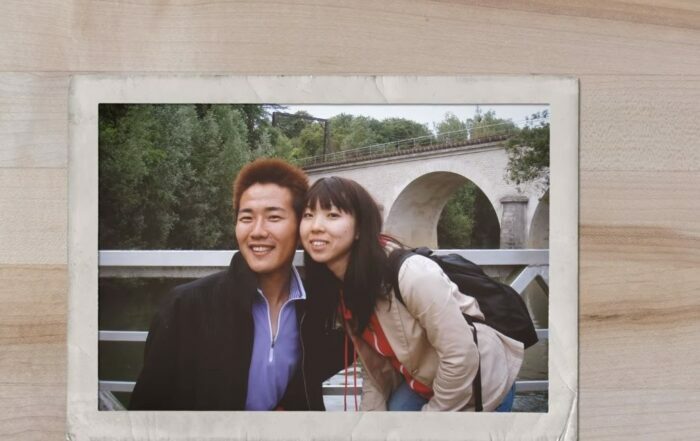 He quit his job and went for a solo trip for 6 months where he enjoyed the food, the time and the fresh air. 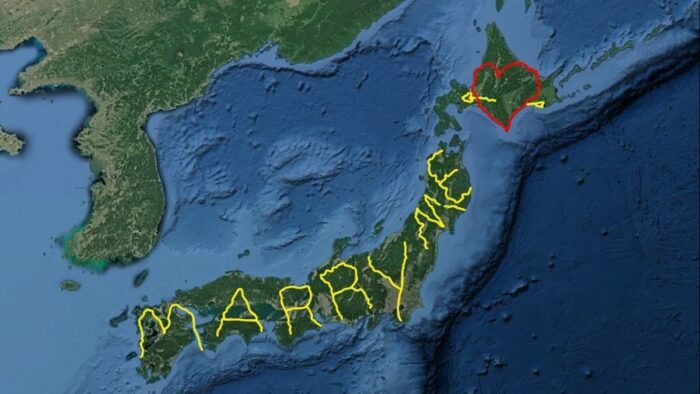 He travelled from the island of Hokkaido to the shores of Kagoshima using a GPS device and uploaded the data on Google Earth to get a ‘Marry Me’ artwork. Travel experience for half a year? Done. Proposing to your girlfriend? Done. Setting a World Guinness record? Done. 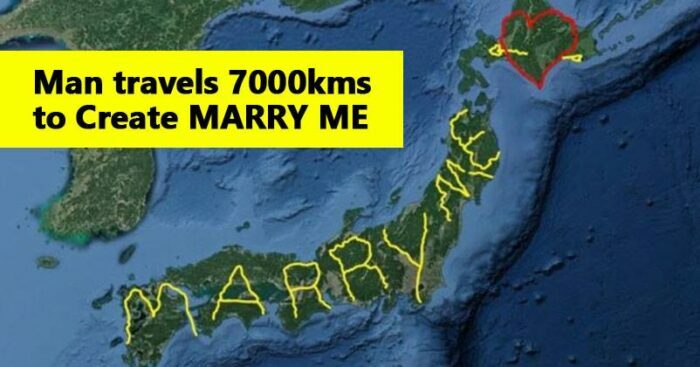 Yes, not only did Yassan get a ‘Yes’ from his girlfriend, but he also established a world record for the largest GPS artwork. Which is why, it’s been 10 years now, yet Google couldn’t be prouder when it posted the throwback video on twitter recently. You can say, GPS artwork proposals are going to be the new millennial trend. Forget hot air balloons, candle-light dinners or romantic getaways. Plan a trip, live the dream and come back to your soulmate to get a ‘yes’ to the ring!